The Applied Biosystems StepOne Real-Time PCR was specifically designed to streamline to process of qPCR. This quantitative real time PCR comes with an easy to use touchscreen graphical user interface (GUI) allowing the user to quick start an experimental run without using the computer. This advanced Real-Time PCR works well with TaqMan Gene Expression and Power SYBR green assays bringing the next level of PCR to first time users. The ABI StepOne delivers quantitative analysis during amplification, cycle by cycle, in real time, during a key phase of PCR. This is ideal for researchers looking to tweak their methods on the fly. This qPCR is cost efficient to use with a 3 color/ 48 well format for precise, quantitative real-time PCR results that performs standard and fast PCR reactions in less than 40 minutes. This PCR system also features automated SNP genotype-calling, auto-baseline and auto-threshold for simplified data analysis, and a long life LED based optical system. The ABI StepOne qPCR is simple to use with an intuative touch screen interface that allows the user to quickly navigate and choose different Real Time PCR methods which include thermal cycling, fluorescent detection, and reaction set up. Additionally, this realtime PCR comes with a built-in design wizard to help the researcher build their own custom methods. Just click on the Applied Biosystems Design Wizard, answer a few questions and the let the StepOne do the rest. The Wizard guides you through template types such as ramp speeds, nucleic acid, quantitation method, detection chemistry and more. The Design Wizard will also ask you to choose the plate layout (48 well, or PCR strips) along with reaction mix and standard dilution calculations. Easy as 1,2,3. 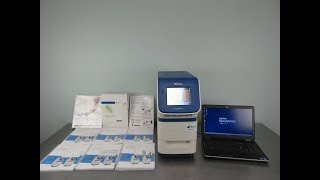 This ABI StepOne qPCR comes with a Windows 7 Notebook computer running the latest 2.3 software that allows user multiple plots view for simultaneously assessing data from four perspectives. The ABI Software is extremely easy to use and works with the ABI 7500 FAST and Applied Biosystems StepOnePlus Real Time PCR as well. This PCR machine also includes a USB Flash Stick port to allow the researchers to take their results with them. You can also save your data on the computer and create customer looking graphs and reports which easily export to Excel, or Microsoft PowerPoint. The ABI StepOne includes fluorophore detection chemistries include FAM and VICdye-labeled TaqMan probe-based assays, and SYBR Green I dye chemistry. The TaqMan probe-based tests deliver outstanding specificity and sensitivity needed for accurate Real Time PCR analysis. The SYBR Green dye kits are an economical alternative for target identification, initial screening assays, or methods which require only a few reactions. StepOne applications include standard curve for absolute PCR quantitation and relative quantitation. The application includes Relative standard curve and comparative, as well as genotyping, multiplexed assays and melt curve analysis. Data collected in all 3 filters for all wells regardless of plate setup. Plate setup may be altered after run completes. This ABI StepOne Real Time PCR is in excellent condition and ready to ship. All of our lab equipment comes backed with our standard warranty. Should you have any questions, please don't hesitate to contact us.